This journey through the heart of Alaska reveals a land with a rugged but undeniable charm, one that has not yet relinquished all of its mysteries. The Alaskan wilderness still boasts spots that have managed to remain untouched by man. In travelling to this wondrous frontier land, you’ll be among the privileged few. This itinerary will treat you to places of pristine wilderness and exquisite beauty, from Denali National Park, with its snowy mountains and sweeping vistas, to the majestic College Fjord in Prince William Sound. You’ll even cross the Arctic Circle. Combine that with the mighty Rocky Mountains and you’re likely to be crossing a few personal, as well as geographic, frontiers. Prepare to capture the majesty of the natural wonders and unique sights on an exclusive photo walk designed for Scenic guests. Learn all the tips and tricks to capture the perfect shot on your phone. 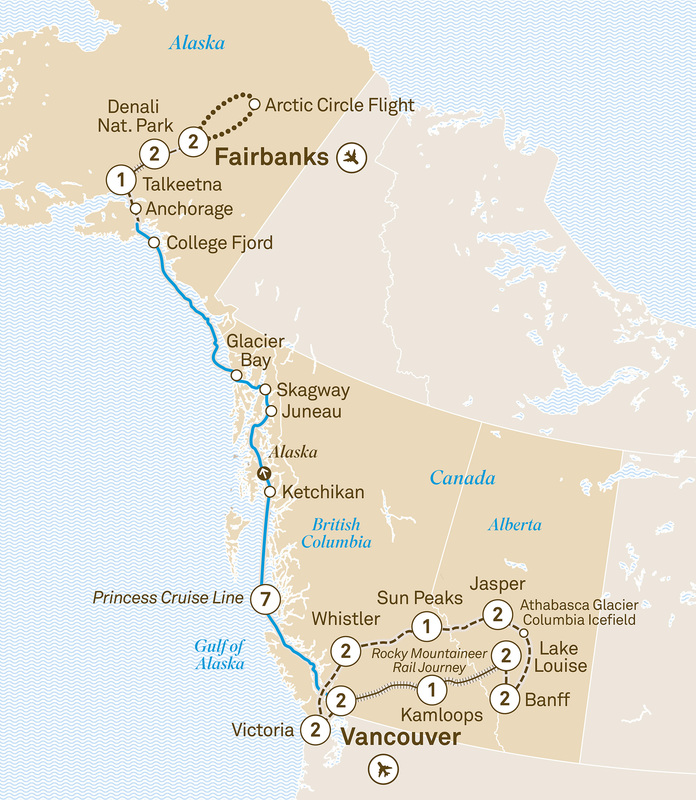 Embark on one of the most iconic rail journeys in the world, the Rocky Mountaineer. Be pampered by the GoldLeaf Service in your glass dome carriage. Tonight, stay at a Kamloops hotel as assigned by Rocky Mountaineer. Feel your awe and excitement peak as you carve through the otherwise inaccessible terrain into the Canadian Rockies. Arrive at Lake Louise for your two night Special Stay in a lakeview room at the iconic Fairmont Chateau Lake Louise. Set a sunrise wake-up call for a special treat. Catch the first glimpse of the stunning colours painted across the mountain, lake and glacier outside your window. Take your pick from casual or fine dining options. Head out at dusk on a unique wildlife spotting experience, in search of Banff’s magnificent beasts including deer, elk, caribou and the elusive grizzly bear. Jasper National Park is one of the world’s largest Dark Sky Preserves. Join astronomers from Jasper Planetarium for a breath-taking dark sky experience and an exclusive supper under the stars. Arrive into Sun Peaks for a relaxing stay at the Sun Peaks Grand Hotel. Visit Squamish Lil’wat Cultural Centre where a First Nations ambassador treats you to a unique cultural experience. Choose your Whistler activity today. The more active can zipline or take a jet boat ride. Alternatively, enjoy a mountain adventure tour or the Peak 2 Peak gondola or soar above on a Helicopter flight.